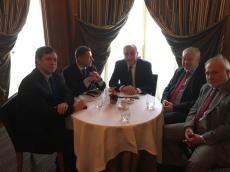 Azerbaijan’s Foreign Minister Elmar Mammadyarov is having meeting with OSCE Minsk Group co-chairs in Paris, the country’s foreign ministry spokersperson Hikmat Hajiyev wrote on Twitter May 15. “At the meeting Armenia-Azerbaijan conflict and recent developments in Armenia are being discussed. Azerbaijan stands ready for substantial talks for soonest resolution of the conflict,” wrote Hajiyev.